Here we have the beautiful Chrysler Limo, the perfect way to travel through Essex in style on your big wedding day. If you're looking for Wedding Limo Hire in Essex then you have come to the right place. Love Limos have a deluxe fleet of limos available for hire in the Essex area, and with years of experience of working with top quality motors, we have all the skills and expertise to point you in the direction of a classy weddy car, which we have readily a vailable to hire. Planning your big day can seem like a herculean task and the thought of organising transport for a wedding party can at times seem a daunting task, but here at Love Limos, we have everything to cater to your transport needs. Whether you are looking for a stunning bridal car, something bolder for the groom, or even a larger, sophisticated limo for all of your bridesmaids, you are in incredibly safe hands. You're guaranteed to make a scene and a grand entrance on your special day when you consider limo hire from Love Limos in Essex. Our aim is to give you a stress free day in terms of travel around Essex all drivers are friendly and reliable, meaning you know you'll arrive at your chosen venue in Essex on time, after all noone wants to be fashionably late on their wedding day. All drivers are smartly dressed and ready to be your chauffeur around Essex for the day, looking after you in your special moments, whether its making your final journey as a single man/woman with your nearest and dearest, or its your first moments as a married couple. We are available to arrange transport to and from the wedding venue to the reception and even onto a hotel or UK airport destination for that well awaited honeymoon. For Wedding Limo Hire in Essex, make sure you get in touch with the Love Limos team. As part of our aim to make your big day in Essex run smoothly, we will stay in contact with you in the weeks leading up to the wedding to ensure we are up to date with the wedding schedule. We will also contact you to construct a travel plan making sure you get to and from venues in and around Essex efficiently without delay. There will also be time allotted to take the customary bridal photos along side the car to show the sophistication and glamour involved in your big day when you come to get the wedding album out. Love Limos offer executive wedding car hire in Essex and limo hire in Essex. Whether you want to go along the traditional route of hiring a Rolls Royce or Bentley or you want to make a scene and go for a more outlandish stretch hummer in a vibrant colour, we can cater to your needs. In any of our cars you are guaranteed to make a statement. As well as being able to look at our extensive online gallery you are more than welcome to come and view the cars in person to ensure they are the perfect mode of transport for your wedding, which we have no doubt they will be. Here at Love Limos we want to make sure that your wedding day runs smoothly and you get to sit back and enjoy the best day of your life. So feel free to fill out a contact form or call us on 01992 663 338 we look forward to hearing about your plans for the big day and hopefully we can be a part of it. Everyone knows that an Asian wedding can be the most vibrant, majestic and colourful of all and in Essex why would you expect anything less. In our Essex fleet we can offer a wide range of cars that will be perfect for the big day, whether it be a brightly coloured and affordable pink stretch limousine, an extravagant stretch hummer, or if you really want to make a statement why not hire our stretch Ferrari, guaranteed to get you noticed for all the right reasons. 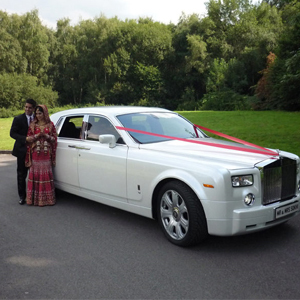 Or alternatively if you want something slightly more understated but able to stand out from all of the colour and elegance of the day, why not hire our beautiful White Rolls Royce Phantom Drop Head or perhaps a Silver Bentley Flying Spur, definitely capable of making a bold statement on the big day in Essex. We offer transport for everyone involved in the wedding party including bride, groom, bridesmaids, grooms men and close family. Love Limos are committed to giving your big day the touch of class and elegance it deserves, we are able to decorate cars with ribbons in colours of your choice to ensure you make the statement you want to make and stand out from the crowd on your big day.